2 or 4 holes are drilled through a collected block which is then secured with a closing mechanism. Multiple use binding - contents can be easily replaced. This binding is often chosen for small-run editions or even single circulations. We offer representative, original branded self-binders for your company. Closing mechanism is selected depending on the product's format. Spine – from 20 to 85 mm. Drilled or punched sheets are thrust on a metal or plastic wire-o and stamped. 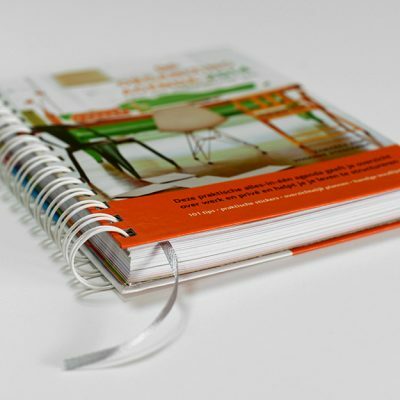 This is a specific binding which offers a freedom of choice - even sheets of different materials can be bound together. Publications bound with a wire are easy to open and browse. 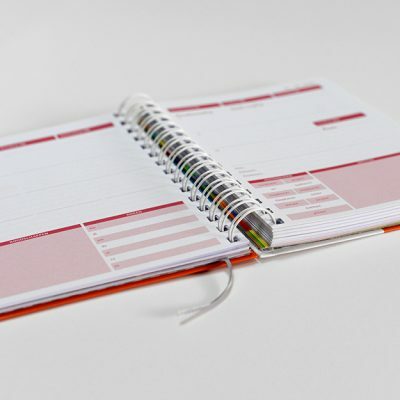 Wire-o binding is often used for methodological or teaching material, but most commonly - to bind calendars, notebooks. Sheets with drilled holes are often fixed with decorative screws, leather strings, different ropes or even anything that could be put through. It all depends on your imagination and creativity. Moreover, it is a practical choice as contents can be easily replaced. Mostly used for unique and exclusive advertising publications, such as menus.